Puyo, Ecuador – On April 11th in the city of Puyo, Ecuador, the Waorani people of the Pastaza province, an indigenous Amazonian tribe, will take the Ecuadorian government to trial alleging numerous human rights violations in the government’s efforts to earmark their lands for oil extraction. The Waorani people’s efforts to protect their ancestral territory from oil extraction – nearly 500,000 acres of highly biodiverse, primary rainforest – has emerged as a flashpoint in the South American country, highlighting the stark gap between the Ecuadorian government’s thirst for oil revenues to relieve international debt and indigenous peoples’ internationally recognized rights to free, prior and informed consent, self-determination, collective territory and the rights of nature. Amidst the backdrop of decades of contamination and cultural disruption in indigenous territories across the Amazon by oil operations, the Waorani’s lawsuit aims to protect their homeland, one of the last bastions of wild-standing forest, from a similar fate. While international and Ecuadorian law recognize indigenous peoples’ right to free, prior and informed consent over any decision that affects their lands, the Waorani’s lawsuit, cofiled with Ecuador’s Human Rights Ombudsmen, alleges that the Ecuadorian government employed time-tested tactics of misinformation and manipulation within Waorani communities in order to deceive the Waorani and get the signatures required to put their land up for auction. 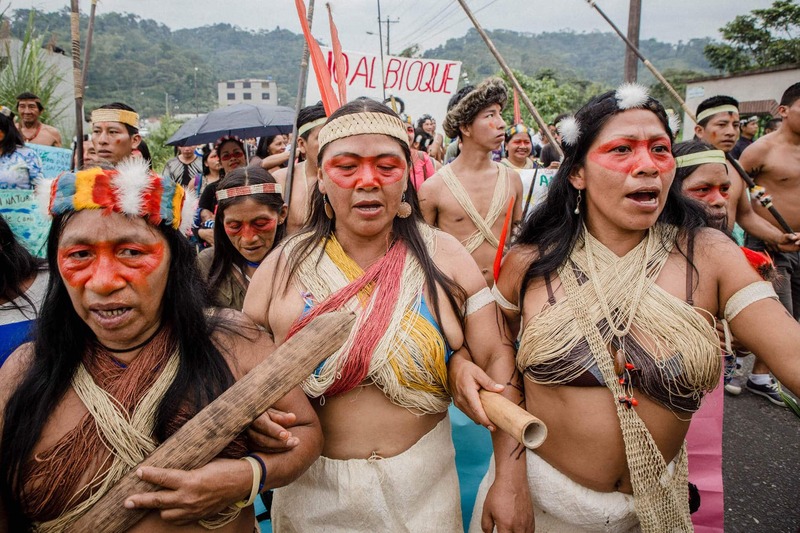 The trial will bring hundreds of Waorani youth and elders from their jungle communities to the city of Puyo, where they will be joined by other indigenous nations from across the country and North America for a march and a forum on the systematic violations to the fundamental rights of indigenous peoples and the threats to their territories in the Amazon basin. The first hearing in the case, held on March 13th, was suspended after Waorani women took over the courtroom with song in protest of unfair treatment by the judge. If successful in their lawsuit against the Ecuadorian Ministry of Energy and Non-Renewable Natural Resources, the Secretary of Hydrocarbons and the Ministry of Environment, the Waorani people will effectively protect their ancestral lands from destructive oil drilling, disrupt the contemplated auctioning of 7 million acres of indigenous territory, forge a legislative path forward for the strengthening of indigenous rights, and provide an invaluable precedent for other indigenous nations across Ecuador, and the Amazon, to do the same.